Anna Checcoli, a former classical dancer and law graduate, belongs to an ancient Italian noble family of French origin. We spoke recently about her wonderful collection of hand-held fans . The following interview contains Anna's thoughts on her collection as well as some amazing examples of antique fans. ephemera: When did you become interested in hand fans? Checcoli: I have always had fans around me, since I was a child. I live surrounded by antiquities, almost all owned by my family. I received my first fan from my aunt, who received it from my grandmother. ephemera: It sounds like your remarkable family history played a role in your collection. Did you begin consciously--knowing what you would collect--or did you just one day discover what you were doing? Checcoli: I began to collect consciously, but it became a real profession slowly. I mean that I started to study seriously about fans a little later, about twelve years ago. Checcoli: Collecting fans is very expensive! Anyway, the Internet is a big help for all collectors today. It opens the doors all over the world, so you needn't to go to the specific country to find what you look for. My choice is to find at least an exemplar of any possible typology. ephemera: What are your favorite items in the collection? Do you have a 'crowning jewel' or 'show stopper' in your collection? Checcoli: I always say that my fans are all my children, and my true children are a little jealous! I haven't a favorite item, they are identical for me from a sentimental point of view. Of course, some of them are really precious, and have a consistent material value, but they aren't more darlings to my heart. 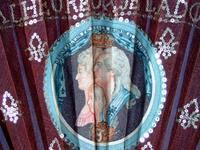 However, the most interesting are the Queen Anne Stuart's fan, the Marie Antoinette's fan, the Tzar Alexander III's fan, a XVIII° century articulated fan, a fan of XVI° century...and many others. Checcoli: The study of fans is very difficult. You can't learn about this item in a short time. I suggest, as a first approach, three books with the same title Fans. The first of Susan Mayor, the second of Nancy Armstrong, the third of Hélène Alexandre--of course not in order of importance. If you wish to start in collecting fans, always to catalog them, specifying materials, decorations, history, date, measures, and value. If you find it, put them in their original case; otherwise, frame only the ones you wish to show, and the ones it's impossible to fold and close. In the other cases, put them in tissue paper, and fold and close them without any problem: for me, a framed fan is a died fan. I need to touch them. ephemera: That's great advice, Anna. Thank you for your time in answering my questions. You have a beautiful collection. Try to sell them on Ebay.